WASHINGTON, March 22, 2018 – Easter spending is expected to total $18.2 billion this year, almost on par from a record $18.4 billion in 2017 but still the second-highest level on record, according to the annual survey released today by the National Retail Federation and Prosper Insights & Analytics. A total of 81 percent of Americans will celebrate the holiday and spend an average of $150 per person, down from last year’s previous record of $152. According to the survey, consumers will spend $5.7 billion on food (purchased by 87 percent of shoppers), $3.2 billion on clothing (48 percent), $2.9 billion on gifts (61 percent), $2.6 billion on candy (89 percent), $1.3 billion on flowers (39 percent), $1.1 billion on decorations (42 percent) and $780 million on greeting cards (46 percent). In preparation for the Easter holiday, 59 percent of consumers will shop at discount stores, 46 percent will visit department stores, 28 percent will make purchases online, 25 percent will go to a specialty store and 25 percent will go to a small business or local store. Among smartphone users, 30 percent will research products or compare prices on their devices while 19 percent will use their phones to make a purchase. Consumers intend to celebrate Easter in several ways: 60 percent will visit family and friends, 58 percent will cook a holiday meal, 51 percent will go to church and 17 percent will go to a restaurant. 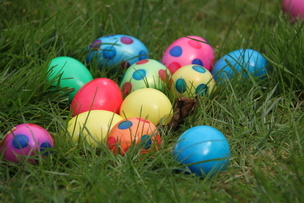 The Easter Bunny is expected to have a busy holiday season: 35 percent of consumers will participate in an Easter egg hunt and 16 percent will open gifts. In addition to traditional holiday events, some consumers will pursue more leisurely activities: 45 percent will watch TV, 11 percent will shop online, 9 percent will shop in a store and 8 percent will go to a movie. The survey, which asked 7,737 consumers about their Easter plans, was conducted March 2-14 and has a margin of error of plus or minus 1.1 percentage points. NRF is the world’s largest retail trade association, representing discount and department stores, home goods and specialty stores, Main Street merchants, grocers, wholesalers, chain restaurants and internet retailers from the United States and more than 45 countries. Retail is the nation’s largest private-sector employer, supporting one in four U.S. jobs — 42 million working Americans. Contributing $2.6 trillion to annual GDP, retail is a daily barometer for the nation’s economy.